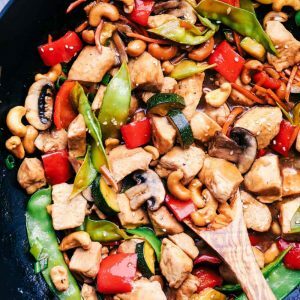 Cashew Chicken Stir Fry is so easy to make and filled with fresh veggies, chicken, and crunchy cashews. The glaze on top is incredible! 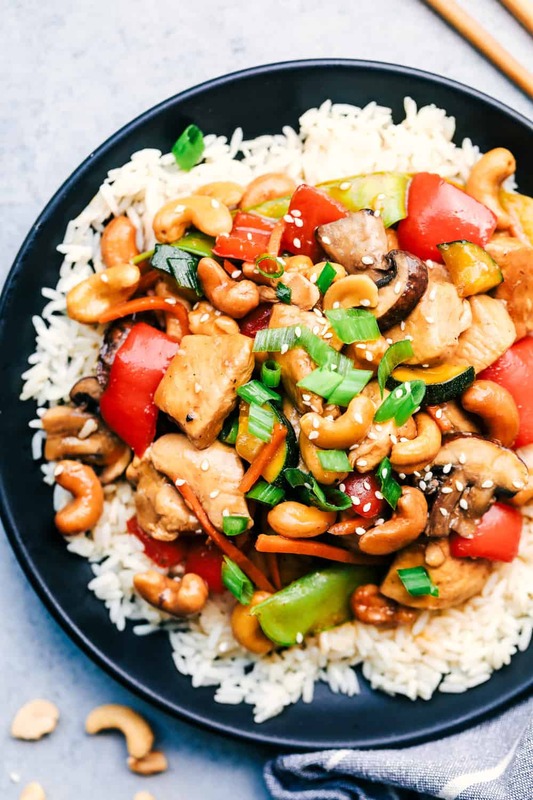 If you are looking for even more amazing stir-fry recipes, be sure to try: 15-minute Garlic Shrimp Stir fry, Honey Garlic Chicken Stir Fry , or even Won Ton Shrimp Stir Fry. I am definately obsessed with cashews. And asian inspired meals. So when the two of them combine into one meal… you know its going to become an instant favorite. I love being able to use fresh veggies in a meal and that is why I especially love a good stir fry. It is a complete meal all made in one pan. I also added zucchini into this meal and everything came together perfectly. The glaze on top of this chicken is absolutely perfect! The sauce thickened up and coated the chicken so well. The flavor was unreal! My hubby said this was one of the best things that I have made. I can’t wait for you to try it! 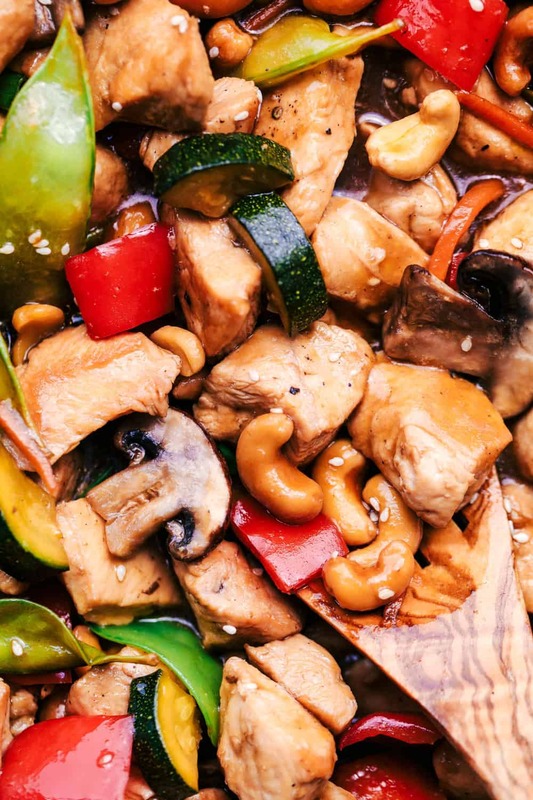 How do you make a good stir fry? To start, browning your chicken in a medum skillet or wok over medium high heat. Then add in your veggies and continue to cook until the veggies start to become tender. Add in cashews. Add in chicken broth, soy sauce, brown sugar, and sesame oil. In a small bowl whisk cornstarch and water and add to the sauce. Pour over chicken and veggies and simmer for 2-3 minutes until sauce has thickened. What can I add to a stir fry? 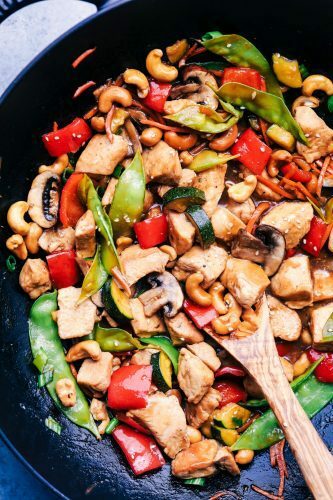 In a medium-sized skillet or wok over medium high heat add olive oil and chicken. Brown until almost cooked through and add zucchini, bell pepper, mushrooms, carrots, and snow peas. Cook until veggies are tender and chicken is no longer pink. Add cashews. Add chicken broth, soy sauce, garlic, brown sugar, and sesame oil to the pan. In a small bowl whisk together cornstarch and water to make a slurry. Pour into pan and stir until incorporated. Let simmer for 2 minutes or until sauce has thickened. Garnish with green onions and serve over rice if desired.